Bead, Swarovski® crystals, fireopal, 5mm Xilion bicone (5328). Sold per pkg of 24. Item Number: H20-8938CY Have a question about this item? 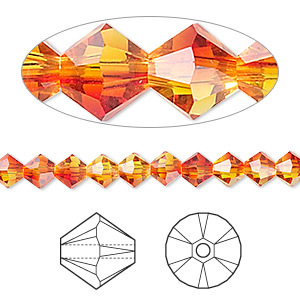 A conflagration of blazing reds and bursting oranges, Swarovski's fireopal is aglow with a crackling inner flame and outer shimmer that brings jewelry designs to life. The unsurpassed brilliance only Swarovski® crystals can offer delivers luxurious flash and flawless consistency in each precision-faceted crystal. Swarovski® crystal components are made in Austria and are considered the finest products of their kind in the world. Bead, Swarovski® crystals, fireopal, 5mm Xilion bicone (5328). Sold per pkg of 144 (1 gross). Bead, Swarovski® crystals, fireopal, 5mm Xilion bicone (5328). Sold per pkg of 720 (5 gross).